Jebb Hassan Agha (Syria) (AFP) - Thousands of civilians were under siege Saturday in an Islamic State group stronghold surrounded by US-backed forces in northern Syria, as the jihadists claimed deadly attacks on a Damascus shrine. IS has fought back with deadly bombings despite being pressed on several fronts since it declared a "caliphate" in Syria and Iraq in 2014. 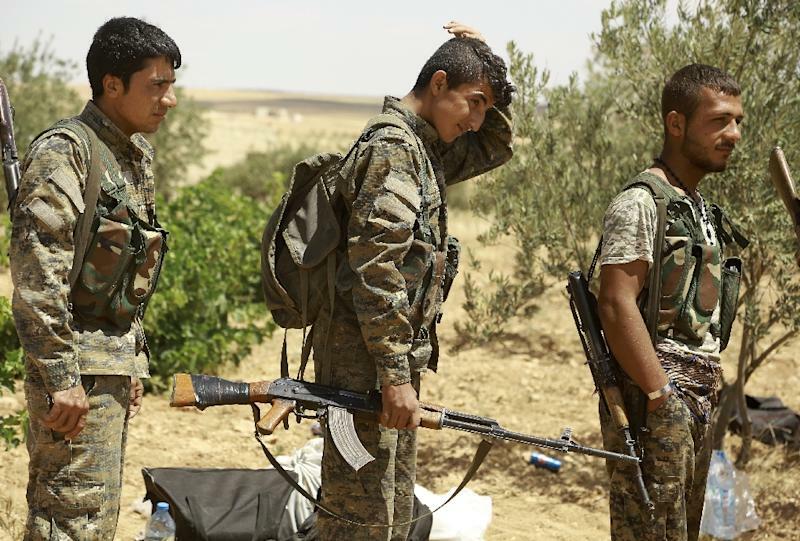 The Syrian Democratic Forces alliance supported by US air strikes encircled the town of Manbij on Friday, cutting the group's main supply line between Turkey and its de facto Syrian capital of Raqa. 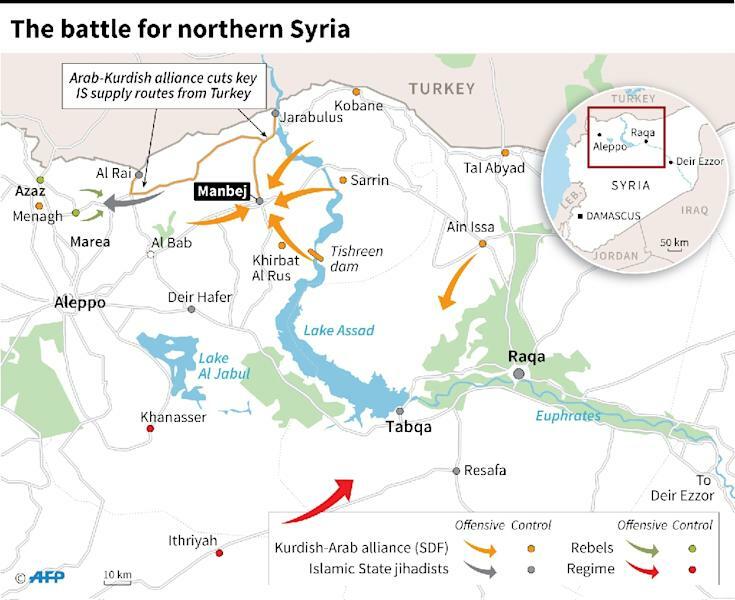 Manbij lies at the heart of the last stretch of IS-controlled territory along Turkey's border, and was a key point on the jihadists' supply route. 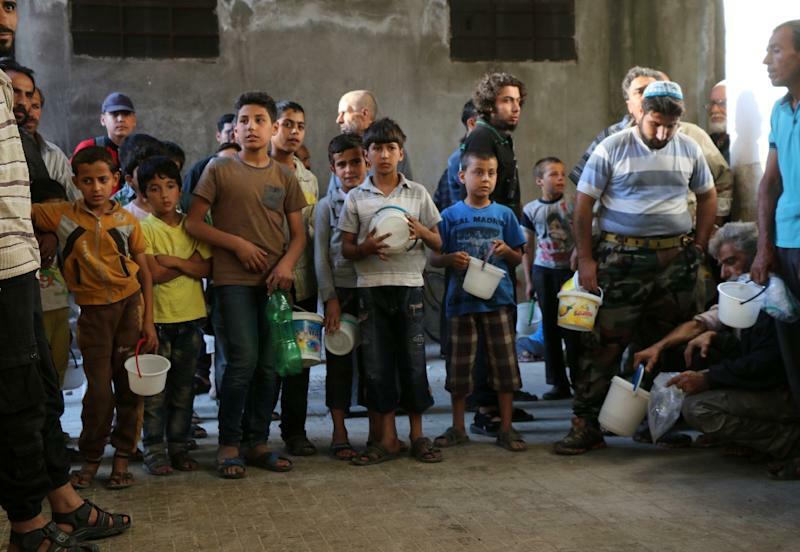 "Tens of thousands of civilians still there can't leave as all the routes out of town are cut," the Britain-based Syrian Observatory for Human Rights monitor's head Rami Abdel Rahman said. He said at least 193 IS fighters and 22 SDF troops had been killed as well as 37 civilians, most of the last group in coalition air raids, since the alliance offensive against Manbij began on May 31. "Bakeries in the town haven't been open since Friday and food is beginning to become rare," Abdel Rahman said. This week thousands of people fled Manbij, which had a pre-war population of about 120,000 -- mostly Arabs, but about a quarter are Syrian Kurds. Outside the town in areas reclaimed by the Kurdish-led alliance from IS, residents expressed relief. "We're so happy and we hope Manbij will soon be liberated as we have relatives there," said Munzer Saleh in Jebb Hassan Agha village, 13 kilometres (eight miles) to the southeast. "Our village was known for cigarette smuggling so Daesh was always after us," he told AFP, using an Arabic acronym for IS which prohibits smoking. Doha Hajj Ali, a young woman, cursed the jihadists and their strict rules. "They'd say, 'Cover your eyes'... Make-up, parties, and weddings were not allowed." Residents said the village has run out of bread and water, and an AFP reporter saw a young boy beg for bread from passing cars. "We haven't eaten bread for two days," he said, after the SDF seized the village at the start of the week. Dakish Fatimi, a Kurdish Red Crescent official, said his team had treated dozens of civilians wounded by landmines planted by retreating IS fighters. South of Manbij, pro-regime fighters backed by Russian air strikes were 15 kilometres from the jihadist bastion of Tabqa's military airport. Near Damascus on Saturday, IS bombers targeting a Shiite shrine killed at least 20 people including 13 civilians, the Observatory said. The official SANA news agency said two suicide bombers, one in a car, attacked the entrance to the Sayyida Zeinab shrine which is revered by Shiites worldwide. The IS Amaq news agency said they were carried out by three suicide bombers. US State Department spokesman John Kirby condemned the bombings. "This terrorist act demonstrates once again the inhumanity and brutality of all that Daesh does and all it stands for,"‎ he said. The shrine, some 10 kilometres (six miles) south of the centre of Damascus, is heavily guarded by pro-government forces but has still been the target of several jihadist attacks. IS bombings near the shrine in February killed 134 people, mostly civilians, according to the Observatory. In January, another IS attack killed 70 people. Lebanese Shiite militant group Hezbollah cited the threat to Sayyida Zeinab as a main reason for intervening in Syria's war on the side of President Bashar al-Assad. The shrine contains the grave of Zeinab, a venerated granddaughter of the Prophet Mohammed, and is renowned for its glistening golden, onion-shaped dome. The war in Syria -- which began with the brutal repression of anti-government demonstrations in 2011 -- has killed more than 280,000 people and displaced millions. Peace talks between the regime and opposition have stalled, including over the lack of humanitarian access. An aid convoy carrying food entered the regime-besieged area of Al-Houla in Homs province on Saturday, the International Committee of the Red Cross said, in the second such delivery in months. But regime forces also bombarded the rebel town of Daraya near Damascus for the second day, preventing besieged residents from accessing their first food aid since late 2012 after it was delivered on Thursday.